STOP SIGN. A red-and-white regulatory traffic sign. This is the only octagonal (8-sided) traffic sign, you can easily recognize it by both shape and color. 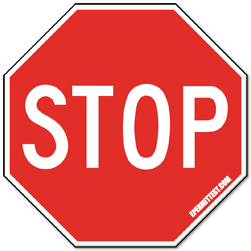 At an intersection controlled by a "STOP" sign, you must come to a complete stop and check for pedestrians and cross traffic. Yield to other traffic going through the intersection and any pedestrians crossing the street. At an intersection controlled by a STOP sign, there can be a white stop line painted across the lane, and/or two parallel lines painted across the road. This is a crosswalk. When required to stop because of a sign, you must stop before you reach the stop line, if there is one, or the crosswalk.